If we've learned nothing else from F-B-I agents in the legendary epic Point Break, it's that meatball sandwiches are absolutely delicious (and that Anthony Kiedis is a wonderfully terrible actor). Luckily, there happen to be more than a few great meatball sandwiches (there are 13!) around town that are worth doubling down on. Remember when we were like, “Dude, you have to check out that newish pizza joint in East Hollywood"? Well, you definitely have to go, because now it's got beer and wine, has a killer new happy hour deal, and the menu's got a freshly added, wood-fired meatball panuozzo. You’ve probably walked by this understated joint on Vermont dozens of times on your way to the Dresden or Public House, but little did you know that hidden behind that door was an amazing polpettine al pomodoro: flavor-packed meatballs, provolone, sauce, Parm, and fresh basil. Nestled in a hillside 'hood between Dodger Stadium and the 110 -- once part of a sprawling Downtown Little Italy (yes, we had one!) -- this old-school Italian joint has been serving up some of the best classic sandwiches in LA since just after Grandma Connie was born. While you can't go wrong with the #7 (the best seller, loaded with roast beef, pastrami, and cheese), the move here is the #2: a massive, house-made Italian meatball sandwich served on a flaky roll with peppers, cheese, and marinara sauce. Mario’s may not have the same notoriety or shine of Bay Cities or Sorrento, but this charming, classic deli has been serving reliable subs, pasta, and other Italian classics since ’61. Served on a massive, fluffy roll, the dense, marinara-soaked meatballs make for a satisfying feast. Also, you NEED to order the house-made cannoli. 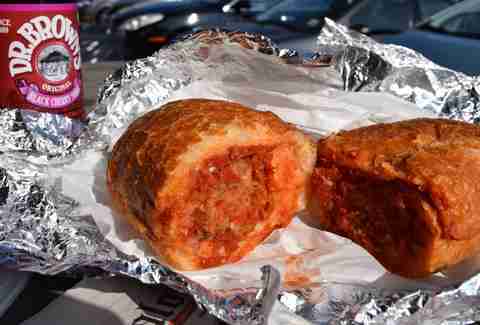 Some have argued that AATB makes a better meatball sandwich than Bay Cities (gasp! ), but we say... they're both on the level. 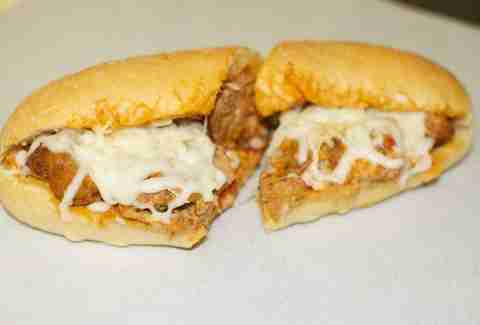 AATB's version has hearty meatballs served atop provolone, doused with marinara, and dusted with Parmesan on freshly baked, crunchy bread. Unlike the many marinara-drenched counterparts, the Palate curiously and successfully goes without sauce, delivering formidable handmade balls of beef, pork, and veal, topped with melted mozzarella, lettuce, tomato, onion, and mustard aioli on a house-baked hoagie. Another long-standing Italian institution, you could easily get lost in the aisles of Sorrento, exploring the tempting imports, but stay on target. Head to the back counter to order up a large meatball coated in sauce (excuse us, paisanos, "gravy") on a pillowy-soft Italian loaf. You want double meat? Of course you do. 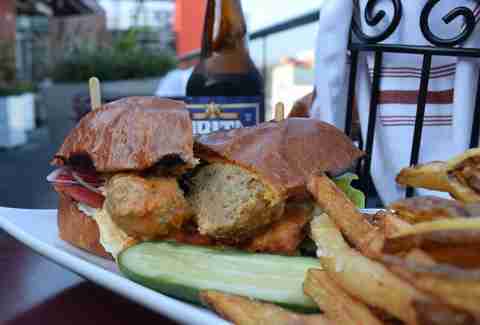 Sure, you've already had the Godmother and the mac & cheese, but now you’re also gonna have the meatball sandwich. Dense, yet surprisingly soft meatballs deliver a hint of fennel that is properly coated in sweet and tangy house marinara and tucked into that signature golden crusty bread. Pro tip: order ahead online and pick it up in the back. 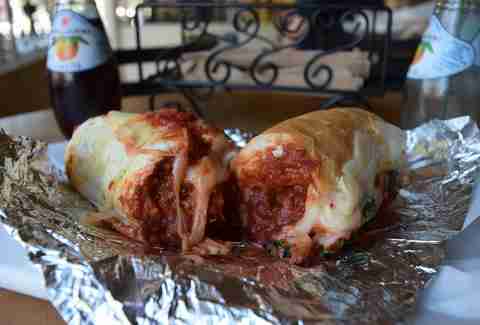 This old-school SFV spot (since ’59) has all you could crave from a classic Italian deli, including a killer meatball sub, loaded with massively-portioned tender meatballs, covered with house marinara, melted provolone, and served on a sturdy Italian roll. Tamarind feels like a cozy NY/NJ deli counter, serving supremely tasty sandos and an impressive array of craft sodas. 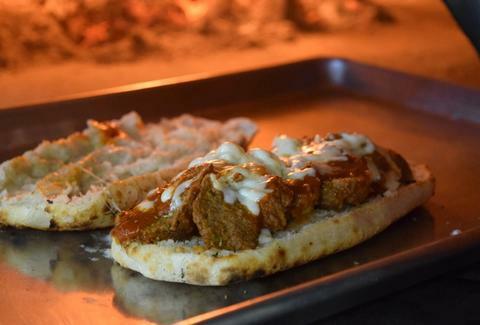 The #10's the move, stacked with Jersey-style meatballs, fresh mozz, and a fiery arrabbiata sauce. 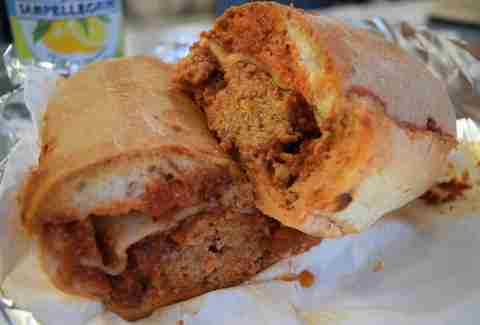 Known since 1952 for its “torpedo” sandwiches and plenty of Italian favorites -- all made in-house -- this South Bay classic serves its Sicilian-style meatball sandwiches two ways: whole or crumbled. While we wouldn’t advise against the whole version, the crumbled is the stuff that dreams are made of. 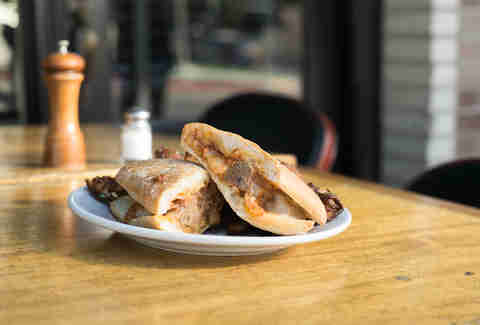 This neighborhood favorite has long been renowned for its Italian classics, including the spaghetti and meatballs, but what is not talked about enough is when the rich, dense meatballs arrive on a toasted ciabatta roll with melted provolone. That, right there, is worth talking about. Well, and eating, too. If this recently relaunched joint didn’t deliver strong with its meatballs, it would be in serious trouble (or in need of another name change). Choose from the extensive variety of meat mixes -- beef/garlic/basil, pork/speck/mozz, turkey/cranberry/goat cheese, spinach/tofu/almond, spicy chicken, or a rotating, special ball -- pick the sauce, and while you could also have them solo or on pasta, today you’re slipping them in a sandwich with an artisan roll, wheat bread, or brioche slider. Danny Jensen is a regular Thrillist contributor and is proud that he made it this far without saying “Mamma-mia-that’s-a-spicy-meatball!” You can get him two on Instagram and Twitter.